The following policy is offered by 5.11 Tactical in addition to the statutory rights to which you may be entitled under the Competition and Consumer Act 2010 (Cth) and other applicable Australian consumer protection laws and regulations. 5.11 Tactical has a 30-day returns and exchanges policy. You may return your merchandise to 5.11 Tactical within 30 days upon the receipt of your product. Refunds will be applied to original credit card used at the time of purchase. 5.11 Tactical will only honor returns on orders placed directly with 5.11 Tactical. 5.11 Tactical will not honor returns on merchandise purchased at retail locations. 5.11 tactical will only honor the exchange of product purchased from an authorized dealer. Exchange must be for the same product, or a product of the same value. 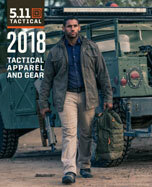 In the event that the retail store where you purchased the item is no longer in business or reachable, 511tactical.com will exchange the merchandise for that of equal value. 511tactical.com does not accept returns or exchanges from purchases made outside the United States. Shipping charges will only be covered by 5.11 Tactical in the event of a return or exchange of a defective product, or a shipping error. Gifts may be exchanged only if original hang tags are attached and the product has not been washed or worn. In the event that the style being returned is no longer available for exchange, a product of equal value may be substituted instead. Before unpacking or using the products make sure it’s the correct item that you ordered. If you try footwear on only do so on carpet or clean non-abrasive floor. Any sign of dirt, scuffs or wear on the sole will void an exchange or credit. 1. The item has not been used. 2. The item has no marks, scuffs, dirt, or stains. 3. The item is in a brand new re-sellable condition. 4. The packaging is intact with no marks, damage, sticky tape, etc. 5. The items tags have not been removed including hang tags and stickers. 6. All items are returned including packaging, parts/accessories, etc. 7. The return is received within 30 days of delivery. No Exchanges or Store Credit will be given for items returned that are not in a re-sellable condition, including packaging of the product. Please be sure to follow washing and handling instructions carefully as 5.11 Tactical does not give returns or exchanges due to mis-washing of products. For returns and exchanges please email us at salesau@511tactical.com or call us at (02) 9790 2225 to obtain a Return Authorisation number. 5.11 Australia does not accept packages without an RA number. If an order is sent to our warehouse without an RA number it will be returned to sender.